Restore power to your camera battery with ikan's Single DV Battery Charger and USB Wall Adapter, which features an interchangeable plate system and includes a plate for a Sony L-Series pack. 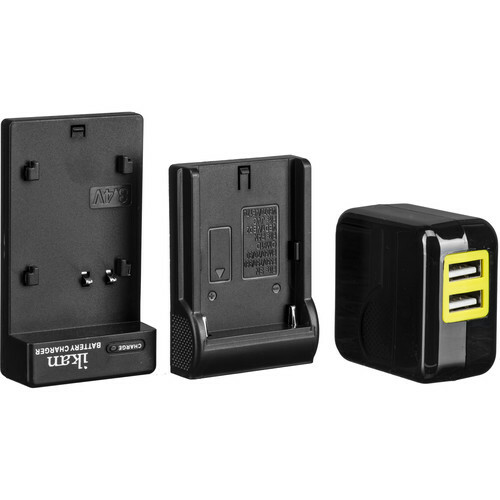 The adapter features 2 USB ports on one side and a standard, 2-prong North American wall plug on the other. A supplied USB-to-Micro USB cable allows you to connect this adapter to the charging cradle. The adapter runs on 120-240 VAC power, enabling use all over the world, and converts that to 5 VDC before transferring it to the charger. Box Dimensions (LxWxH) 5.75 x 4.35 x 3.35"